February is a relatively quiet time in the rose garden. The roses are pruned, the beds are neat and there are even a few leaflets pushing out from the canes. Feeding will not start until March [in Southern California] and the April bloom season seems a long time away. It is therefore a good time to think about the organization of a health maintenance program for your garden so that your roses bushes in April will be healthy and the blooms abundant. Roses, like all living things, face threats to their health. For roses those threats are generally carried by pests and diseases that attack roses and prevent them from reaching their potential. Some roses are much more resistant to disease than others but few roses have much advantage over others in their attraction to pests. So even if you have focused on acquiring "disease resistant roses", you will nevertheless need to take some steps for control because in all cases the control of rose pests and diseases is as important to the health and beauty of a rose as are, say, antibiotics to the health of humans and animals. The key to any effective pest and disease control program in the rose garden is regularity. Established pest populations are very difficult to get back into control; established diseases are next to impossible to eradicate. So the point is to establish a regular program aimed at prevention, in the case of disease, and early detection and control, in the case of pests. I spray my roses on a weekly basis during the prime rose growing seasons, i.e. from February to June and in September and October. But as an exhibitor I am after a high level of control, As a rookie looking primarily for a beautiful garden display a program that calls for spraying every other week will be quite adequate. There are many choices among sprayers; the key is to get something that works well for your garden. Durability is a plus as you are going to use this tool often. More important is to get a size adequate to spray your garden in one pass without refill. A good rule of thumb is that one gallon of spray mixture will service about 24 large rose bushes. 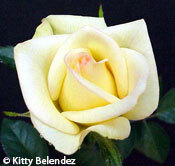 A miniature rose for this purpose counts as 1/3rd of a bush; a climber counts as two bushes. Count your roses, allow some room for planned future plantings, and get a sprayer of appropriate size. Effective spraying requires good coverage of the entire rose bush. Poor coverage is worse than not spraying at all as you will have wasted your time. Spray your roses in two passes. Turn the spray nozzle upside down and spray the bottom side of the rose foliage first (being sure not to spray in your face or upwind). Then turn the nozzle around and go over the rose bushes from the top. Spray to the point of run-off. The leaves should just be beginning to drip. Reading chemical labels is admittedly hard on the eyesight but it is important. If the label says 1 Tablespoon per gallon that is exactly what you should apply. More is not better nor is less more environmentally correct. Buy some measuring spoons and cups for this purpose only and measure your amounts carefully. Once you have determined the proper application take a marking pen and write it in large letters on the bottle; this will save your eyesight. Those who turn to the rose texts to learn of the pests and diseases that attack roses will often come away discouraged as the numbers seem endless. But it isn't really that hard. For simplicity sake there are insects and there are diseases. Of the insects that attack roses there are three that are of prime importance in Southern California. These are aphids, thrips and spider mites. Control methods which focus on these pests often keep down the population of other less common pests. Of the rose diseases there are also three of importance. These are powdery mildew, rust and downy mildew. Again control measures aimed at these diseases will usually pick up other diseases such as black spot which although devastating to roses in much of the country is little seen in Southern California. Prevention is the key to disease control on roses, and thus the application of a fungicide with every spraying is usually indicated. Insects need be addressed only when they appear but you should be vigilant and not wait until they have destroyed your blooms before you swing into action. It is easier to be vigilant when you know what to look for and when. Weather conditions and the progress of growth are the major factors in the appearance of both disease and pests so it is helpful to learn the conditions that foster their appearance. Aphids attack new growth on the roses, and favor conditions with cool nights and warm days. 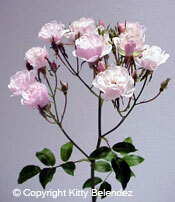 They are usually found on the newly developing rose buds and typically appear in March to reach their height in April. The threat of aphids attacking roses continues until the weather gets hot and abates during the summer, only to reappear in September with the new growth of the fall bloom. Thrips are the tiny winged insects that crawl in the rose blooms themselves, particularly the white and lightly colored blooms. They appear later in the season, typically in March and are in full force by June. Again they abate in the summer to reappear, usually with less intensity, in the fall. Spider mites are microscopic arachnids that appear on the undersides of leaves and turn them yellow. Left unattended they can defoliate a rose bush in a few days. They like hot conditions and are the primary pest of summer. Powdery mildew, distinguished by white growth on young foliage, is encouraged by cool nights and bright summer days and arrives usually in tandem with aphids. Rust is the fungus with the bright orange pustules on the undersides of leave; it prefers cool moist conditions and is more often encountered in coastal areas. Downy mildew is difficult for rookies, and experts for that matter, to recognize. It is distinguished generally by purple blotches. It is a water born fungus that is encouraged by heavy rainfall. All of these diseases do poorly in the summertime heat. Pest and disease control require specialized products. Which products are best is often a subject of debate and may require tradeoffs between toxicity and effectiveness. Many serious rosarians have environmental or health concerns that come into play in the selection of such products. Others want simply the product that works the best. I what I consider to be a balanced approach. I demand an effective product to an existing known problem but given the choice between several effective approaches will select that which is least toxic. For my rose garden purposes the fungicide of choice is Funginex; there is hardly a week that goes by where I do not use it on my roses. It is relatively non-toxic and mixes well with about everything. It will eliminate rust in my garden and is useful in preventing powdery mildew. To control powdery mildew, however, you may need something stronger. The best, if you can get it, is Rally 40x (also know as Systhane or Nova). Rubigan is good but has some phytotoxic effects in cool weather and also induces resistant strains. Fungigard works reasoanly well in the Security flowable formulation. And Compass works pretty well on roses. For those seeking less toxic approaches in the rose garden there are a number of baking soda formulations which work reasonably well on powdery mildew. I have read recently of a soon to be introduced formulation of potassium bicarbonate under the name Armicarb which promises to be an even better non-toxic solution to powdery mildew. The early reports on the neem oil product Rose Defense are inconclusive but may be worth a try. For downy mildew on roses it is also useful to spray periodically, and especially after rainfall, with a metallic based fungicide such as Zineb (zinc), Manzeb (manganese), Mancozeb (manganese, copper and zinc), or Alliette (aluminum). Mancozeb is the active ingredient in the lawn fungicide Fore. Rose Defense is also claimed to be effective on downy mildew. Bear in mind that the control of downy mildew in our rose gardens is problematic at best. For aphids and other sucking insects on roses. Orthene is about all that you will really need. It is a systemic which means that it has long lasting effect; usually two weeks. Insecticidal soaps are less toxic however since they kill on contact they require more frequent application Mites can usually be controlled with a water wand spray on the undersides of the leaves at the base. For a big attack use Avid. There are reports that Rose Defense is also very effective against spider mites on roses. Whatever is used, the key to mite control is to understand their 3 day cycle. If your roses are troubled by mites be sure to apply your control measure again in 3 days to wipe out the new generation that will appear after the first spraying. Thrips on rose blooms are easy to kill by contact with about any insecticide. the problem is that they fly in from all over and do their damage to the blooms quickly. They also burrow into the rose blossoms and are tough to contact. I find that Orthene gives about as good a control as you can get without going out to spray the roses every morning and night while they are active. If I really want to control thrips on roses I also use Cygon, however this is a very strong systemic and should be used sparingly and handled carefully. Keep in mind that complete disease and pest control in the rose garden is an impossible dream so do not become discouraged. Just as we come to expect colds and occasional disease in our lives we should come to expect that there will be pests and disease in your garden. But the fact that efforts at complete elimination have diminishing returns should not blind you to the fact that very good returns can be realized from modest efforts at health maintenance of our roses. And since those returns come in the form of beautiful roses, they can be very handsome indeed.